See more objects with the tag flowers, women's fashion accessories, women, carrying, leaves, slit. See more objects with the color grey dimgrey darkslategrey darkolivegreen darkslategrey or see all the colors for this object. This is a Woman's pocket. It is dated 18th century and we acquired it in 1957. Its medium is linen warp, cotton weft, wool embroidery and its technique is embroidered on plain weave. It is a part of the Textiles department. Before the mid-19th century, pockets were not sewn into women’s clothing, but were a accessory. Pockets, usually worn in pairs, were tied around the waist between a woman’s under-petticoat and her petticoat or skirt. Openings in the side seams of these voluminous skirts provided a discreet way for her to access their contents. 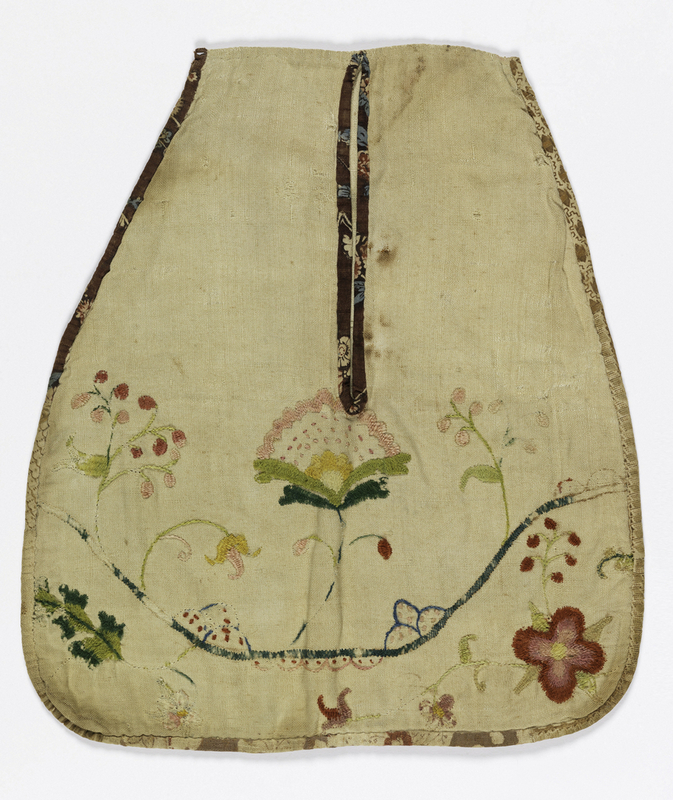 Pockets were not intended to be seen while worn, and many were plain, although pockets with decorative embroidery were given as gifts. They were quite generous in size by today’s standards, and were used to hold a variety of personal items which might include money, a handkerchief, spectacles, sewing tools, a comb or small mirror, personal letters, and a snuff or bonbon box. 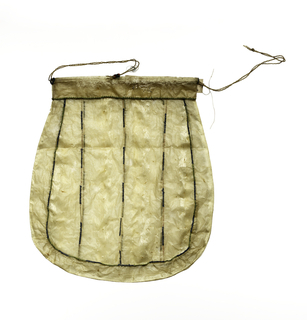 This object was featured in our Object of the Day series in a post titled Pick a pocket. This object was donated by Mrs. Roxa Wright. It is credited Gift of Roxa Wright.